Narrow black rod culminating in a semi-circle with white and black wire threaded through, attached to a fan-shaped blue piece of plastic. Laminated formica, machine-cut and hand polished. Thin PVC card - scored with a scalpel and pleated. Plastic rod. Each piece is drilled and tied together with a synthetic tennis racket string. 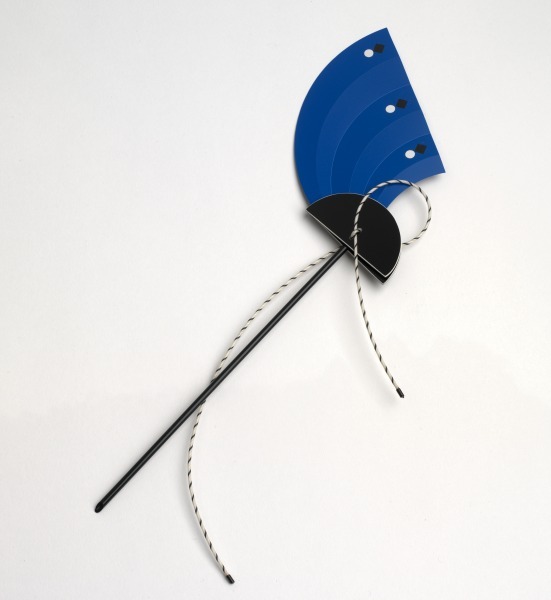 Hairpin, Louise Slater, 1984, Crafts Council Collection: J176. Photo: Todd-White Art Photography. Until recently I have just been working with PVC but it is a fragile material when scored and thus limiting, so I have started to use the formica with it which complements and strengthens it. This piece is held together entirely by the string and is one of the first I have made. I am developing a range of necklaces and pins in a similar way.